Cyberbullying is a form of harassment that uses electronic devices, Internet and social media networks to repeatedly intimidate, humiliate or threaten someone. Cyberbullying is an increasing problem: one in four teenagers has been a victim of cyberbullying, 270 million users on Facebook are not who they say they are, and one in six 12-year-old boys think that Twitter exists to abuse others online. 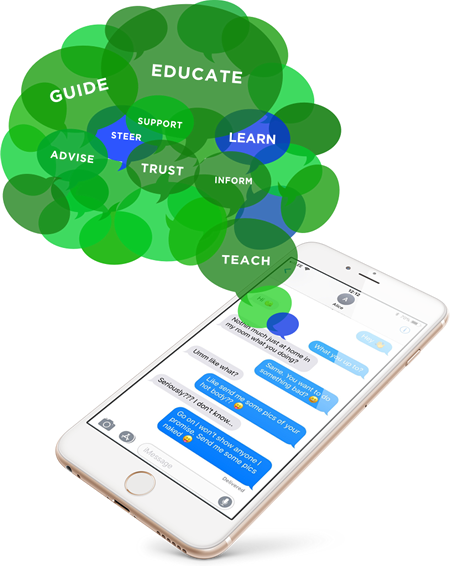 In order to fight cyberbullying, SafeToNet (London, UK) has created an informed safeguarding service that warns parents, in a real-time, of the risks that they children face online, and it provides tools to manage those risks. SafeToNet is one of the winners of the d-LAB societal challenge that aims at Fighting cyberbullying through mobile technologies. The objective of SafeToNet is to identify harmful bullying and sexual content by filtering it before it is sent and before the damage is done. It notifies parents and as such helps families to be informed about the risks their children encounter online. SafeToNet respects child’s privacy and rights. SafeToNet app uses Artificial Intelligence algorthms to stop harmful messages before they are sent. It applies natural language processing and behavioral analytics to detect potentially negative behaviour, while preserving user privacy at the same time. Additionaly, the app provides device management tools and mood sensing services. SafeToNet enables children to interact and explore the online world with safety but without barriers. It is an educational tool that allows a constructive open dialogue between parents and children. SafeToNet has designed, in collaboration with d-LAB, a 6 months pilot in order to test and validate the SafeToNet solution. The pilot benefits from the participation of the Spanish MNO Orange, that will help to evaluate the results in a real-life environment, and the Polytechnic University of Catalonia (UPC), that will adapt the app to the Spanish and Catalan languages. During the first 4 months, UPC-CIT trainees will be adapting the artificial-intelligence based solution to the Spanish and Catalan environment considering words and expressions that are used to aggress others online. Given that the machine learning engine needs to become accurate when it is used for the first time in the new language, the initial two months are going to be an “accuracy testing” period. In addition, a validation process will be conducted by the Cybersecurity Center of Catalonia (CESICAT). Once the adaptation is finished, the app will be tested in various schools across Barcelona, targeting children between 12 and 14 years old in different socio-economic neighborhoods in order to cover a wide array of linguistic nuances and cultural particularities to demonstrate that SafeToNet can detect and notify parents when cyberbullying is taking place. During the following phase, a trial with Orange MNO employees and their respective families will take place with the purposes of validating and improving the efficiency of the SafeToNet app in an real test environment. The consequences of cyberbullying go beyond low self-esteem, worthlessness and helplessness. It impacts mental health and can lead to self-harm. It has an impact on social infrastructure like social care, hospitals and charity helplines, which is a significant cost to society. In 2015 that 20% of children have been a victim of cyberbullying – in the region of Catalonia, this is just under 30,000 children who experience low self-esteem, depression, feelings of worthlessness – which can often lead to self-harm affecting on how these children reach their potential in life. Mobile technologies can become a part of the solution by being at the centre of prevention, awareness and reduction of the existing levels of online harassment and violence. SafeToNet is a perfect example of how artificial intelligence software aims at creating an inclusive solution educating children by identifying and blocking harmful content before it is sent, minimising the impact and harm.